A few months ago I got the opportunity to do something I’ve never done before: deliver a speech. This wasn’t a “gimme the mic I’m drunk at a wedding and love these two” kind of speech; we’re talking a twenty minute, formal talk at a real conference full of highly focussed and intelligent people that want to learn useful information on a technical topic. A simultaneously thrilling and daunting experience, as you can imagine. 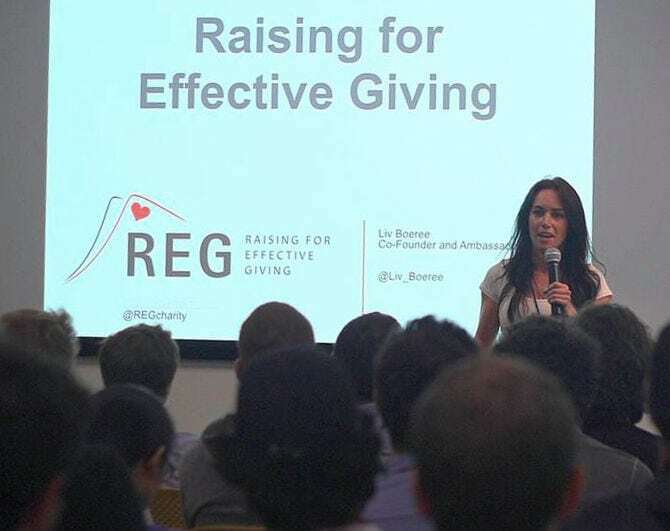 You probably know that I’m all about Raising for Effective Giving (REG), the fundraising organisation a group of us created to use poker for good by raising money for highly effective charities. It’s part of the wider Effective Altruism (EA) movement, whose goal is figuring out and implementing the best ways to solve the world’s biggest problems. In the 18 months it’s been running, REG has gathered a lot of interest from the global EA community, mostly because a) it’s been pretty damn successful so far and b) poker is, at first glance, a weird industry to decide to build an EA movement in. The EA community holds an annual summit at Google HQ in San Francisco, and got in touch about me speaking about REG. This was a hugely exciting chance to teach others about our project and to also learn directly from some of the world’s greatest minds on fascinating topics like global existential risks and game-changing technologies. Even better, my absolute hero of heroes, Elon-Frigging-Musk was talking at it too! The only issue was that the thought of standing alone, on a stage and somehow filling this godforsaken twenty minute space with coherent words made me want to vomit. Seriously, at some points I would’ve thrown up and eaten it again if it would’ve made it all go away. My Mum’s dog likes to do that and he seems perpetually happy. To stave off any potential disaster, I got some coaching from the public speaking coach Richard Greene, who was an absolute badass. It’s usually a good sign when someone has given a Ted Talk on how to give good Ted Talks. Richard did a great job getting me to truly enjoy the art of public speaking, and the day passed without me turning into my Mum’s dog. Even better, the talk generated what we hoped it would; inspiring more EAs to start similar REG-type projects in different industries, and thus generating further money for the causes we support through REG. So anyway, it’s now ready for you folks, my dear supportive readers, to watch it. If you come from a poker background, bear in mind that its target audience was data-loving effective altruists who don’t know much about poker, so be prepared for some poker-cheese. Similarly, the EA information might be a bit technical, but nonetheless it should give you good info on REG and what we’re working to achieve. You’ll also notice I manage to say “overwhelmed” twice in the first sentence… I was.